Visiting SEA LIFE Bangkok Ocean World and Chao Phraya River will get you outdoors. 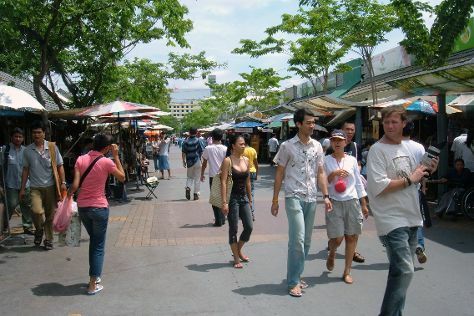 Head to Khao San Road and Chatuchak Weekend Marketfor plenty of shopping. Venture out of the city with trips to Ayutthaya (Ayutthaya Historical Park, Chan Kasem National Museum, & more) and Ancient City (in Samut Prakan). Spend the 14th (Thu) wandering through the wild on a nature and wildlife tour. On the 15th (Fri), spend a thrilling day on the water with a speed boat tour. The adventure continues: explore the historical opulence of The Grand Palace, contemplate in the serene atmosphere at Temple of Dawn (Wat Arun), browse the different shops at Siam Paragon, and tour the pleasant surroundings at Safari World. To find more things to do, photos, and tourist information, read our Bangkok itinerary builder tool . If you are flying in from Brazil, the closest major airports are Suvarnabhumi Airport, Don Mueang International Airport and U-Tapao International Airport. In February, plan for daily highs up to 38°C, and evening lows to 28°C. Finish your sightseeing early on the 17th (Sun) so you can travel back home.